More magic... More gear... More treasure... More Xanathar! Xanathar has spent centuries accumulating loot beneath the streets of Waterdeep. Now, at last, you have the chance to peek inside his extraordinary treasure vault! This book contains nearly 500 items, including mundane and magical arms and equipment for everyone. 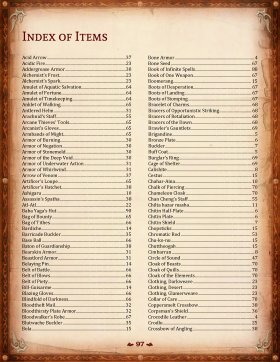 This vast catalog ensures that players will always have the right piece of equipment for the task at hand, while Dungeon Masters will never run out of fresh and original options for your next hoard! Anyone know the legal constraints on using any of this during a podcasted game? You are very welcome to use the material in your podcasts! If you put a link in the show notes back to this page, we'd be very grateful. If someone converted this to Fantasy Grounds I'd buy it in a heartbeat. I only play VTT though so stuff like this is just not efficient for me when I DM unless its in my VTT. 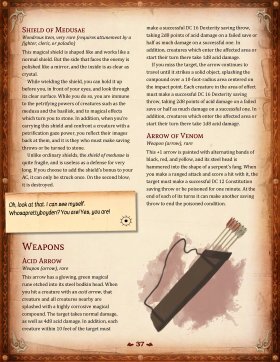 The selection of magic items in this book looks pretty great - though the added armour options really feel like something that requires a lot of caution and DM discretion to not accidentally break bounded accuracy by allowing too much. The armour pieces read a bit like they're intended to be an alternative to full armour sets, more than a supplement to it? But reading through, it's a bit hard to tell if that's RAI, RAW, or just my own interpretation. Hello! R P Davis here, and I'm the one responsible for the armor pieces section. 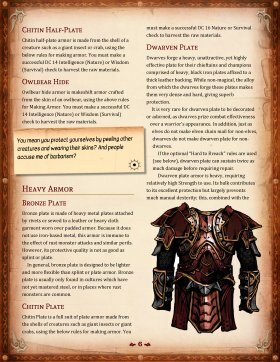 Yes, they are intended to be an alternative to the full armor sets given in the PHB, as well as a way for a player who's a real armor nerd to itemize their loadout in a way they find pleasing. You're right that caution is always the DM's watchword. We bent over backward to see that the items included were not game breaking, and were especially cognizant of bounded accuracy when we assessed things like the armor variants. How many pages is this hardcover book? Great offer with the pdf/printed version combo. WHile I wait for the printed version I've had a read through my pdf copy and really like the inclusion of the variant weaponry and armour materials. 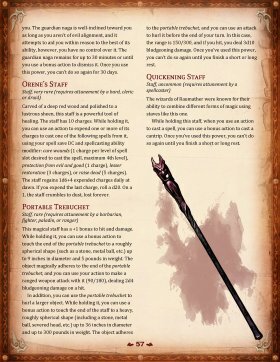 Many of them are familiar from older editions and its great to see them given the 5e update. While its a shame I can't inlcude them in my Adventurers League games I'm totally going to be adding them into my home games. Thanks so very much! Glad to hear you are enjoying the Vault! Looking forward to your thoughts on the print version! Are prices for these pieces listed as well? All mundane items include a market price. 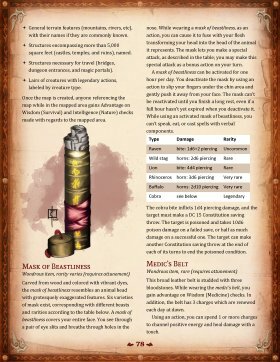 Magic items included in the collection are not priced, and should use price based on rarity as presented in the DMG or Xanathar's Guide to Everything. regarding armor maintenance: so it says you need tinker's tools to maintain armor. What if you don't have the tool proficiency? Would you allow some sort of DC Check or the armor simply corrodes without a way to repair it? If using this optional rule, it would be advised to either acquire a proficiency with tinker's tools, travel with someone who has that proficiency, or make frequent visits to tradespeople in towns for armor maintenance. Personally, if I were to incorporate this rule, I would absolutely require the proficiency in order to use tinker's tools for armor maintenance. Having said that, you may certainly tweak the rules as presented to fit your own campaign. Perhaps allowing for other tool proficiencies (leatherworker's tools, smith's tools) to stand in place of the tinker's tools proficiency. I would advise against incorporating this rule without requiring some sort of proficiency in a toolset. Recently bought this and it's a great book overall. Just one problem I've noticed that could be a disruption to combat balance. The Buckler option allows a player to wear one without needing to be proficient in the use of shields, keeps their hand free so they can use a crossbow or two-handed weapon AND grants them +1 AC. It quite literally has no downside and creates a precedent for every single character to use them and never look back. Everything else in the book seems fine however, it's just this one thing that I personally think creates an irresistible option for players which could change the strength of the characters from the first level till the last. Adding a shield proficiency requirement certainly does not seem unreasonable, but to that end, I don't see it impacting anyone but casters. 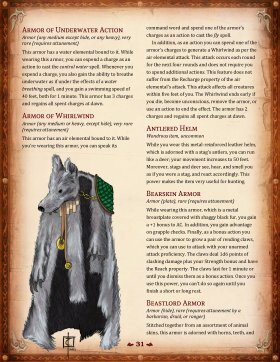 How dose the piece meal armor work with unarmored defence? I don't expect it would. Piecemeal Armor is still armor. Is there a Fantasy Grounds version for this? Not as of yet. It is certainly something we can look into. 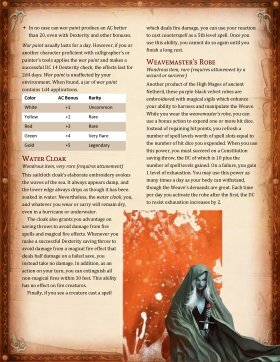 If you are interested in having this converted for use in the Fantasy Grounds virtual tabletop program, shoot me an email and we can work out some details (grimlore.entertainment@gmail.com). I would LOVE to have this in print as well. As soon as we are able, we will pursue a print release. Ask and ye shall receive! Print is NOW AVAILABLE! I'm confused where the random properties come from on 2 of the artifacts at the end? +1 major beneficial property? Major and minor beneficial and detrimental properties for Artifacts (and how to determine them) are explained in Chapter 7 of the DMG. Happy to be of service! Please be sure to rate & review! First off I think you guys do great work! But I am a little confused about the mechanics of the tower shield,so you have half-cover and plus 3 to your AC giving you a total of plus 5 AC? Hi, R P Davis here. That's my work. Depending on circumstances, yes, +5 to AC is pretty much default. Of course, it's up to individual DMs to decide what circumstances apply. For example, I'd carefully consider facing before applying the full bonus. Man this is really something else. Thank you! 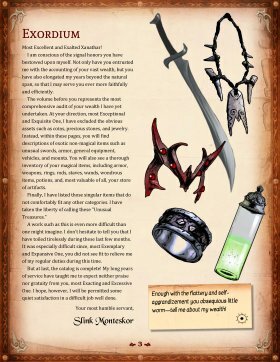 I especially like the 3.5 converted magic items like the Earth Plate, for my own campaign I homebrewed my own earthplate a while back and it's remarkably similar to yours. The differences mainly being length of the activated effect, it's hp threshold, and the one i made grants the ability to speak terran. It's a great item and I love that you converted it. Glad to hear you're enjoying it! Please be sure to rate, review, and tell all your friends! This looks amazing! is it for 5th edition?